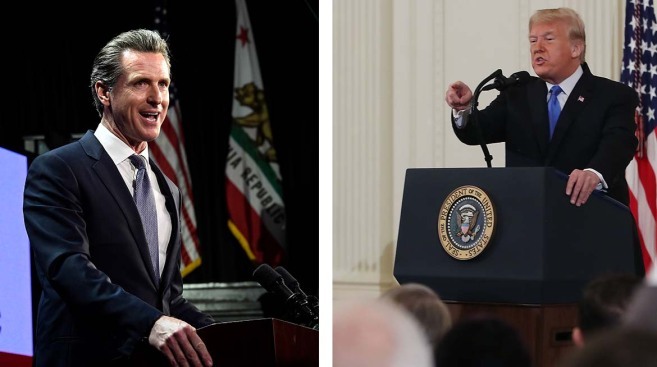 California Governor-elect Gavin Newsom (left) responded to a tweet from President Donald Trump regarding federal funding to battle wildfires. The International Association of Fire Fighters is calling President Donald Trump's comment about massive wildfires burning throughout California "irresponsible, reckless and insulting." Trump said Saturday via Twitter that "there is no reason for these massive, deadly and costly fires in California." He added that "billions of dollars are given each year, with so many lives lost, all because of gross mismanagement of the forests. Remedy now, or no more Fed payments!" On Sunday morning, Trump tweeted again about the fire, saying "with proper Forest Management, we can stop the devastation constantly going on in California. Get Smart!" The firefighters union responded to what were Trump's first words about the wildfires, including a blaze that incinerated most of the Northern California town of Paradise and killed at least nine people, saying that his "crass" suggestion in cutting off federal payments to the state "shows a troubling lack of real comprehension about the disaster at hand." "The early moments of fires such as these are a critical time, when lives are lost, entire communities are wiped off the map and our members are injured trying to stop these monstrous wildfires," Harold Schaitberger, General President of the IAFF, said in a statement. Brian Rice, president of the California Professional Firefighters Association, called President Trump's statements about forest management "dangerously wrong." "The president’s assertion that California’s forest management policies are to blame for catastrophic wildfire is dangerously wrong," Rice, head of the 30,000-member organization, said. "Wildfires are sparked and spread not only in forested areas but in populated areas and open fields fueled by parched vegetation, high winds, low humidity and geography. Moreover, nearly 60 percent of California forests are under federal management, and another two-thirds under private control. It is the federal government that has chosen to divert resources away from forest management, not California." California Governor-elect Gavin Newsom responded to the president's tweet saying that right now is not a time for partisanship. "Lives have been lost. Entire towns have been burned to the ground. Cars abandoned on the side of the road. People are being forced to flee their homes," Newsom tweeted. "This is a time for coordinating relief and response and lifting those in need up." California Rep. Henry Stern (D-27th district) addressed Trump's tweet Friday afternoon during a press conference in Southern California, saying "Fires don't respect politics or jurisdiction." Stern requested that the president "pursue a major disaster declaration and not make this a political incident. We have many parties, many views out here, and this is not about politics. It's about people." Thousands of IAFF members have assisted in rescuing and evacuation people in direct path of the flames, according to the organization.